One of Xiaobo Tan's robotic fish swims in a tank. Photo is courtesy of the Michigan State University video linked at the end of this story. ECE/ISR alumnus Xiaobo Tan has received an award worth nearly $380,000 from the Office of Naval Research. The award will be used to develop highly maneuverable "biomimetic" robotic fish. These robots will be based on biological principles and incorporate biomimetic electroactive polymers. Xiaobo Tan is an assistant professor in electrical and computer engineering at Michigan State University. He earned his Ph.D. in electrical engineering in 2002 and was advised by Professor John Baras (ECE/ISR) and Professor P.S. Krishnaprasad (ECE/ISR). The research will pursue fundamental studies to develop novel electroactive polymer hairs as artificial lateral lines for flow sensing, as well as electroactive polymer-based fins capable of complex 3D deformations. It will advance the performance of robotic fish, and will also provide a controlled platform for investigating the locomotor and sensory mechanisms of real fish. This work will build on previous research Xiaobo Tan accomplished with an NSF CAREER Award for "Dexterous Biomimetic Micromanipulation Using Artificial Muscles: Modeling, Sensing, and Control." That grant provided his research team with a sound knowledge base in electroactive polymers. Xiaobo Tan also is actively exploring the use of schools of robotic fish as mobile sensing platforms in aquatic environments. In collaboration with Professor Lihong Xu, Director of Institute of Modern Agriculture Science and Engineering at Tongji University in Shanghai, China, he is planning to use robotic fish to address growing environmental problems associated with the aquaculture industry. 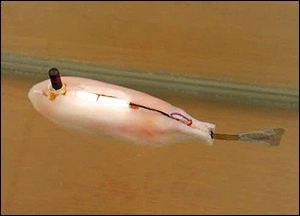 A video of the robotic fish prototype is available for viewing.